Here’s what’s up in the world of TV for Sunday, March 26. All times are Eastern. 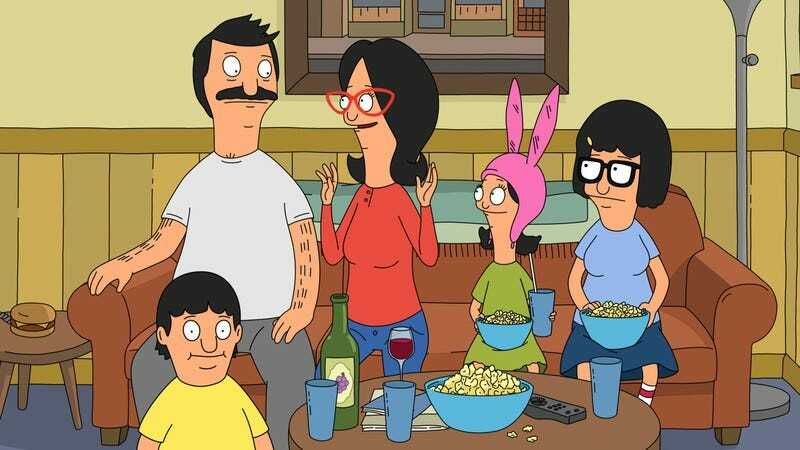 Bob’s Burgers (Fox, 7:30 p.m.): Bob’s Burgers kicks off a very special one-hour episode tonight with “Aquaticism/Ain’t Miss Debatin’”: “When Tina learns that the aquarium is in danger of closing, the Belcher children devise a scheme to keep it running. Meanwhile, Bob realizes that he could learn a thing or two from Linda’s customer service skills. Then, when Tina is recruited by the debate team, she finds unexpected success and an even more unexpected relationship.” Sounds like a whole lot of Tina, which we are totally okay with. Last week, Alasdair Wilkins took a look at how the series deals with Linda; perhaps this week’s review will feature an exploration of Bob’s beloved middle child? To Walk Invisible (PBS, 9 p.m.): In addition to all of the shows listed above, Sunday nights always seem ideal for PBS period dramas. This one is perfect for anglophiles: a look at the Brontë sisters called To Walk Invisible. The reclusive family drew on their considerable imaginations to create some of the most enduring stories in gothic romantic literature, like Jane Eyre and Wuthering Heights, even as they dealt with various illnesses and their brother’s substance abuse. This exploration of the sisters’ short but fruitful lives will likely lead you to revisit one of their all-encompassing novels.